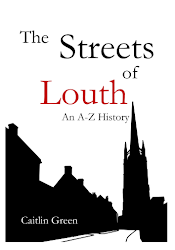 When people write about Louth and it's history, they often focus on the most immediately obvious aspects of the town, including the church, the grammar school, the market, the canal and Riverhead, and civic buildings like the town hall and former workhouses. This focus is, of course, quite understandable, with the importance of all of these elements to the history of the town being clear. In this post, however, I’d like to talk about Aswell Hole and the Gatherums/Springside that runs east from it—although both are, perhaps, a little off the normal tourist and casual visiting routes in the town, they are also of some considerable historical interest within the context of Louth as a whole, as I hope the following will demonstrate! Aswell Hole and the Gatherums, Louth, showing the two large pools and their streams as they appeared on Espin's early nineteenth-century plan of the town, originally published in 1808 and slightly revised to remove the demolished Town Hall in c.1815. Note, the pool of the Aswell Spring originally filled almost the entire Aswell Hole, though its extent was much reduced over the course of the nineteenth century and it was finally covered up in 1974. The names Gatherums and Springside both nowadays refer to the area to the east of Aswell Hole (currently a park) all the way through to Church Street; the name Gatherums is probably earlier and derives from Scandinavian 'gatu-rum', meaning a rough track or droveway. 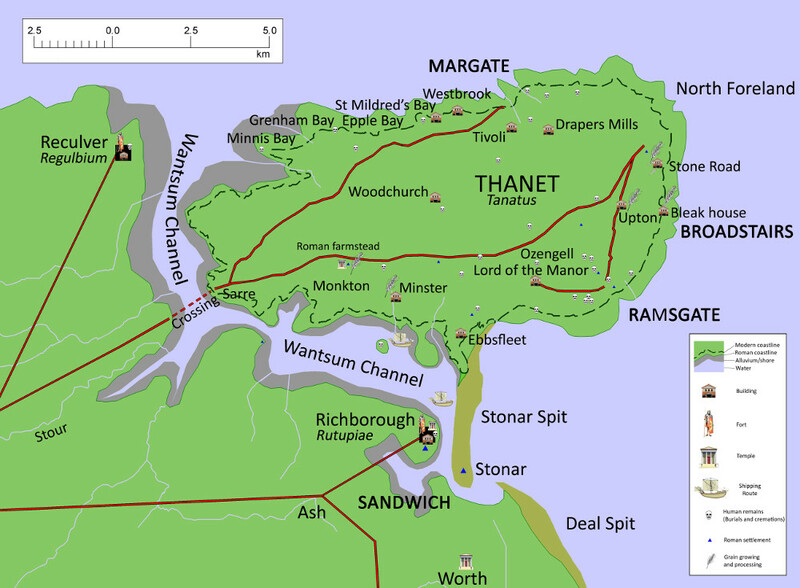 In the thirteenth and fourteenth centuries, both springs fed into the Monks' Dyke, and the former route of the Aswell Spring where it once joined St Helen's spring at Monks' Dyke Head on the right hand side of this map is visible in the property boundaries depicted by Espin. At some point the Aswell Spring was diverted to form a mill pool and drive a fulling mill, perhaps in the sixteenth century (see below), and its waters thereafter flowed north down the open street and then along what is now Eastgate, then Watery Lane, to join the River Lud; this open stream was apparently culverted at some point between 1808 and 1834. 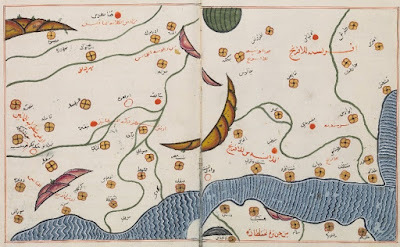 The key to understanding the local import of this area lies in the origins of Aswell Hole. The present Aswell Hole was, until relatively recently, filled by a large pool of spring water which emptied eastwards at a rate of somewhere around 460 gallons-per-minute, running along the back of the properties facing onto modern Queen Street (formerly Walkergate) before filling the old mill pond and later Open Air Swimming Pool off Church Street. This was in modern times known as the Aswell Spring, but the second element of this name is in reality redundant, as the name 'Aswell' means 'the spring by the ash tree'. Furthermore, just to the east of the Aswell pool was a second spring and pool, the St Helen’s Spring, which similarly flowed eastwards in historic times, in this case into the Monks' Dyke and then through to Louth Park Abbey (founded in 1139), supposedly once with sufficient force to allow a loaded skiff to sail from the town down to the Abbey, according to Bayley in 1834. The only remaining open part of the Aswell Spring, flowing through the back garden of property facing onto modern Queen Street (photo: C. R. Green). Aside from this section, the whole of the Aswell Spring is now culverted, as are the waters of the St Helen's Spring. The flow of this section appears to be controlled by the water authority and seems to be much reduced compared to its original output of around 460 gallons per minute. Needless to say, these two medieval springs appear to have had considerable significance for the town in the past. In particular, not only was one of the springs dedicated to St Helen and very probably venerated in the medieval period, but there is also a sizeable body of material that suggests that the springs were an important focus for religious devotion in the Early Modern period too. Of particular note here are the many references to relatively substantial payments being made for the dressing and cleaning of at least the main Aswell Spring in preparation for its blessing and religious usage in the sixteenth and seventeenth centuries. So, William Blanchard bequeathed £3 for the dressing of Aswell and other springs in the town in 1592, and payments for such veneration occur in the Churchwardens’ accounts through the sixteenth century and almost annually in the Louth Corporation records from 1601–77—for example, ‘Ffishers wief’ was paid 4s for the ‘dressinge of Aswell’ in 1609, equivalent to a labour cost of around £580 today. This devotion was apparently primarily focussed on Holy Thursday (Ascension Day), although there are indications that the spring was prepared for other religious festivals too, as in 1559 when Mertyn Chapman was paid 12d by the Churchwardens to dress the Aswell Spring for Christmas. There are also frequent accounts of large quantities of stone and timber being conveyed to Aswell in the aftermath of the Reformation, something which has been thought to indicate an unusual lavishing of attention on this area then. Some of this material was apparently being used 'for paveinge at Aswell... [and] the Raisinge of yt', as in 1621, but the quantities involved would imply that rather more substantial building works were also taking place. In fact, Bayley in 1834 suggested that so many wagonloads of stone and timber are said to have been conveyed to Aswell from St Mary's chapel and Louth Park Abbey in the period after the Reformation, for some unstated purpose, that he could only think that a stone wall was being built around the spring which always fell down as soon as it was raised! Although few traces of any such sixteenth-century building works now survive, there is a quantity of dressed stone in the wall where the Aswell Spring once rose that may well represent the remnants of this activity (the pool was finally fully covered over in the 1970s). Furthermore, Bayley observed that one of the much-decayed late Tudor houses that persisted at Aswell to his day had 'some appearance of having been used for religious purposes', which may well be significant. One might tentatively wonder whether this lavishing of money on the Aswell Spring in the sixteenth and seventeenth centuries might not, in fact, have reflected somehow a redirection of popular veneration and religious activity from the now-forbidden traditional Catholic rites and dissolved Abbey onto what look to have been surviving and apparently unrepressed 'holy wells' of medieval Christianity? The Aswell Springhead, where the spring—now culverted—originally rose; a small portion of the pool and stream remained open here until 1974, when it was finally fully covered over (photo: C. R. Green). Note the dressed stone around the springhead, partially covered on the left by a thin covering of cement with a design set in it, which stands in contrast to the use of brick everywhere else in this part of town; the bottom row of dressed stones directly around the springhead are also angled and shaped. This stonework presumably represents the remnant of the loads of stone brought to Aswell in the sixteenth century from St Mary's chapel and Louth Park Abbey. If the Aswell Hole and Gatherums area is therefore likely to have been of some religious significance to the early town into the Early Modern era, this is not the end of the import and historical interest here, and the Aswell Spring in particular appears to have been of critical importance for the development of Louth. First, it was a key source of fresh water for the town from the medieval period through into the modern era. Its importance in this regard is reflected in the fact that fines were fairly frequently handed out for its defilement in medieval period. So, in 1431, Robert Ffynche was reported to the Manor Court for washing newly dyed black cloths in the Aswell spring; in 1441, John Baumburgh was fined 4d for washing sheepskins in the water of Asewell; and in 1449, nine men were fined 1d by the Manor Court for daily watering their horses in the Aswell spring, 'contrary to ancient custom', thus defiling and corrupting its water. 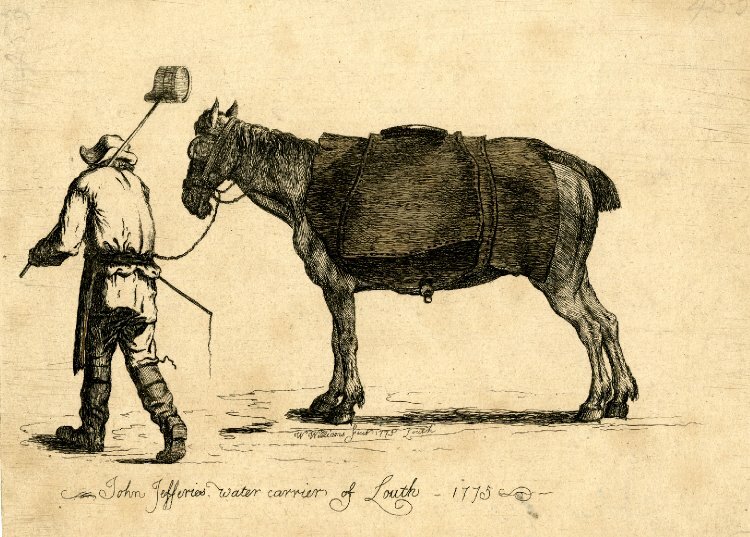 This use of the spring as a source of water continued well into the modern era, when water carriers such as John Jeffries would take their horses down to the Aswell Pool to fill water bags and then sell the water around the town. Second, and perhaps most importantly, the spring water not only acted as a source of fresh water but also gave life to a number of industries. Historically, the most important of these was the cloth finishing industry, which was located in this area of the town. The water from the Aswell Spring was used by both the dyers and fullers—who stamped on cloth in pure water to felt it and give it a smooth finish—of medieval Louth as an essential part of their trade, and this industry may well have driven the medieval expansion and prosperity of the town. It is perhaps not always fully appreciated that Louth was actually one of the most important textile centres in both Lincolnshire and eastern England in the thirteenth and fourteenth centuries, producing, along with Lincoln and Beverley, a distinctive fine cloth that was mentioned by name in customs accounts of that period—for example, in 1307 a substantial cargo of ‘Louth say’ (a cloth of fine texture) was loaded in Hull for Gerard Nerle of Florence on the galley of Andali de Nigro. The thirteenth-century prosperity and expansion of the town—as witnessed by the famous tessellated pavement unearthed two hundred years ago on Westgate and the major rebuilding of the parish church in that century—probably had its roots in this industry and thus ultimately in the pure waters of Aswell Spring. 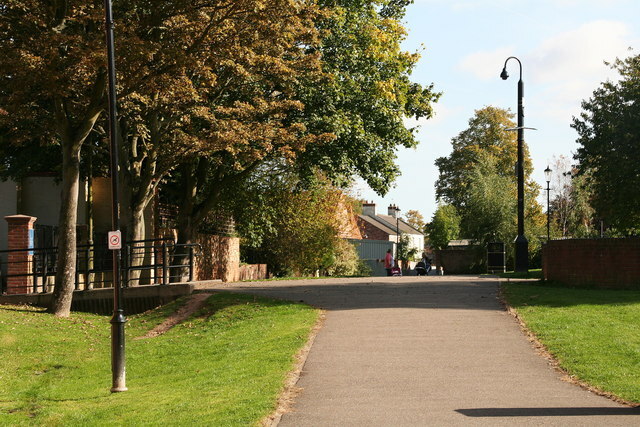 The entrance to Louth's former Open Air Swimming Pool, originally the site of the fulling mill that was powered by the Aswell Spring in the early nineteenth century. The swimming pool itself operated from 1924 through until the early 1970s and was created from the former mill dam, which was filled by unheated spring water that would freeze over in winter. On the ground floor of the building shown was the pit that once held that waterwheel of the fulling mill and also a coke-fired boiler that heated the water for the swimming pool showers, whilst the changing rooms for the pool were located up a set of wooden stairs. The fulling mill seems to have been converted into a corn mill in the early 1820s and continued to function as this through until the early–mid 1870s. Louth’s distinctive cloth continued to be exported well into the fourteenth century, and the cloth-processing industry in Louth still provided employment for thirteen walkers or fullers in the late fourteenth century, according to the 1379 poll tax list. Indeed, the cloth industry in the town is thought to have remained in reasonable health through the fifteenth century and into the sixteenth, with the early sixteenth-century Churchwardens’ Accounts referring to sixteen weavers and ten fullers, along with others associated with the trade. By the end of the sixteenth century, however, cloth processing appears to have been a declining area of local employment. Nonetheless, it did continue. Indeed, the industry was still functioning in this area as late as the early nineteenth century, when the waters of Aswell Spring drove a fulling mill. The mill pool eventually became the town's 'Open Air Swimming Pool' in the twentieth century, until its closure in 1970, and the early nineteenth-century fulling mill may well have been the successor to the unlocated fulling mill at Louth that was owned by John Bradley in 1590. Another important commercial use of the Aswell Spring was by the brewing industry. In 1449 it is recorded in the Manorial Court Roll that Aswell Spring provided the people of Louth with 'clean water for making their beer, as they are wont', and there were at least three breweries listed in this part of town in the 1830s. Indeed, one was actually located 'in Aswell Hole' itself, being said in 1837 (when it was offered for sale) to be 'immediately adjoining Aswell Spring'. 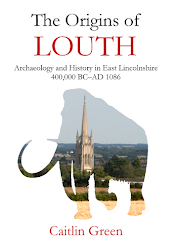 However, it is worth emphasising that the Aswell Hole and Gatherums area of Louth was not simply a religious and industrial focus for the town; it was also a significant residential area of the town from the mid-nineteenth century too. Although there were a few earlier buildings in this part of Louth (not least the surviving late Tudor houses that Bayley mentioned in 1834, said to be 'of the worst workmanship and character'), residential activity was relatively limited and small in scale through until the 1830s. 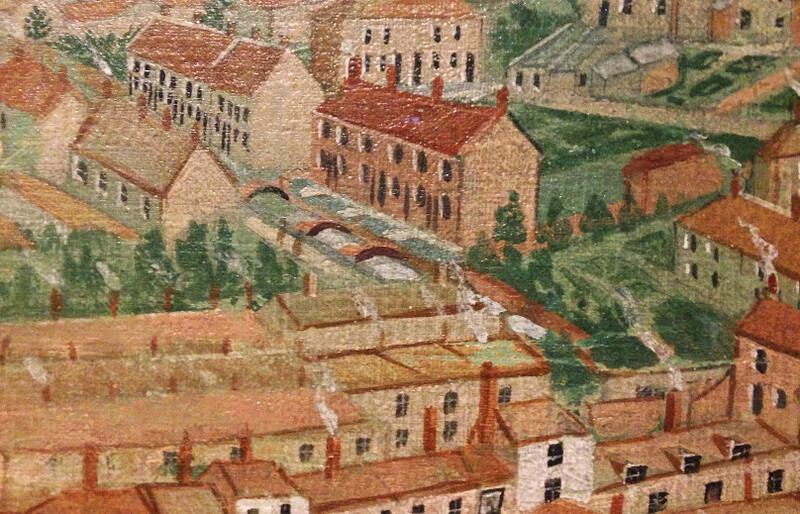 This situation changed dramatically after that point, however, with the rapid construction of tightly-packed terraced housing to the south and east of the Hole and all along the banks of the springs right the way through to Church Street. These houses remained in place until the mid-twentieth century, when they were finally demolished as slums. Looking east along the Gatherums and Springside walk in 2012; up until 1960–1, the St Helen's Spring flowed openly through this area, with nine small footbridges over the stream being used to access the terraced houses on the south side of the stream from the path. These houses were demolished as slums at around the same time as the stream was culverted (image © Copyright Chris, via Geograph, used under a CC BY-SA 2.0 licence). These slum terraces were inhabited by a wide variety of people, from plumbers and ropers to labourers, painters and lodging-house keepers, although a significant number of the buildings here also housed people and businesses that were of considerable 'ill repute' in the mid-nineteenth-century town. Indeed, the area in that period was amongst the most notorious in Louth, with the brothels of the Gatherums and Aswell Hole being both exceptionally numerous and, according to a contemporary journalist, 'of the very worst kind'. Numerous lurid tales were told in the local Victorian newspapers of these brothels and the women who lived and worked in them, such as Ann Kime, Elizabeth Clarke, Suke Mason and Elizabeth Muncaster. Unfortunately, whilst such tales seem to have excited considerable contemporary interest, there is little evidence that much was done to assist the women involved or alleviate the underlying social issues beyond simple condemnation. Moreover, violence and other crimes against these women were both common and rarely punished with the sort of severity that the mid-nineteenth-century Louth magistrates reserved for petty thieves, beggars and exhibitionists in the town. Aside from brothels, the Aswell Hole was also home to a 'tramp lodging house' and beerhouse known as the Lord Nelson or, more popularly, the Rag and Louse, in the nineteenth century. This apparently large establishment was run by Patrick Keyes and his family from the 1840s, the latter being described as ‘a son of the Emerald Isle’, another group of people with whom the local newspapers of the time seem to have had an issue. In 1851, twenty-three people were staying in this establishment, including a large number of agricultural labourers and a self-described beggar, suggesting both that it was of a fairly lowly status and that it must have also been reasonably extensive. As a beerhouse, it was the site of a considerable number of 'disturbances of the peace', and was described by the local newspapers as 'notorious' for its bad behaviour, great noise and disorder, with stolen items being fairly regularly discovered in its rooms and drunken brawls erupting out in the Aswell Hole between its patrons. Of course, the Rag and Louse was not the sole cause of disturbances in Aswell Hole in the Victorian period—for example, in 1848 six young men were each sentenced to two months hard labour for rolling a lighted tar barrel down the horse steps of Aswell Hole at 10pm at night! However, the Rag and Louse beerhouse was sufficiently uproarious that it was finally refused a renewal to its licence in 1869 and the property subsequently appears to have continued solely as a lodging house—it continued to play this role as late as 1901 and 1911, when it was still run by a member of the Keyes family and offered rooms for up to twelve patrons, including two Italians who were travelling with a piano organ at the time of the census. The reconstructed horse steps that lead down from Aswell Street to the Aswell Hole (photo: C. R. Green). Note, Aswell Street probably originated as a medieval access road to the Aswell Spring. 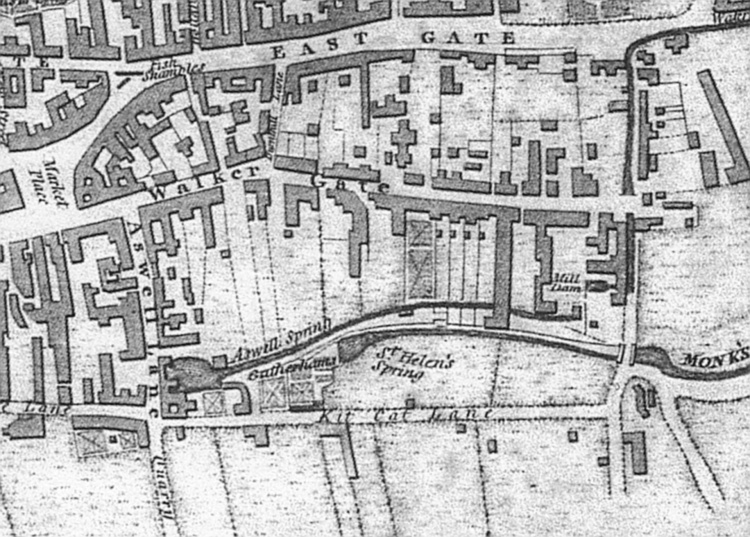 This, then, is Aswell Hole and the Gatherums/Springside, an area of Louth that arguably had considerable significance for the early history of the town. It provided a valuable supply of pure water that powered the industries that led to Louth’s expansion and early prosperity. It was lavished with time, money and materials in the period after the Reformation through until the end of the seventeenth century, probably due to its continuing role as a focus of religious devotion. And it saw a decline in its prosperity and value during the nineteenth century, so that it became one of the most disreputable areas of town, apparently rife with violence, drunkenness and brothels, according to the mid-nineteeth-century newspapers—something that has plenty to tell us about what life was like for ordinary people in the rapidly expanding town of the Victorian period, with its vast numbers of itinerant visitors and labourers, away from the Mansion House, the Corn Exchange, the learned local societies, and the Mechanics Institute. 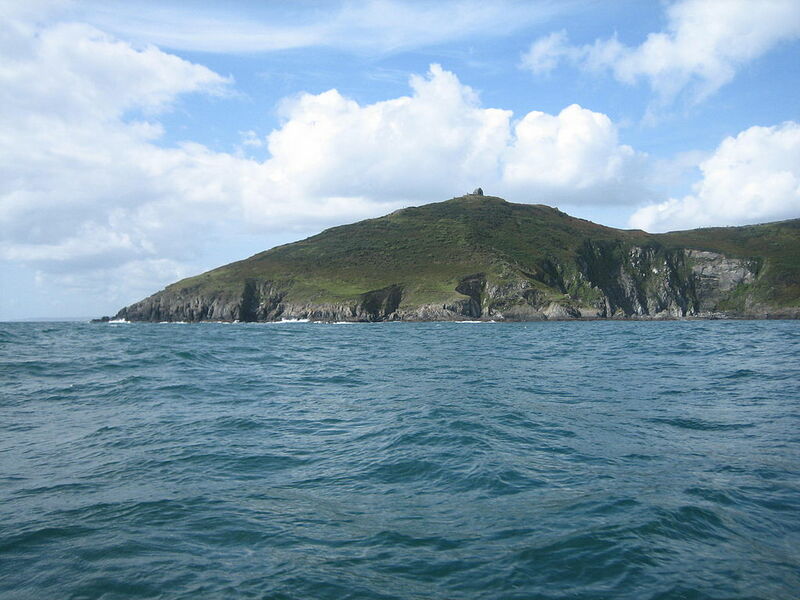 All told, it is a site of considerable historical interest and significance, and well deserving of attention. The content of this post and page, including any original illustrations, is Copyright © Caitlin R. Green, 2015, All Rights Reserved, and should not be used without permission. 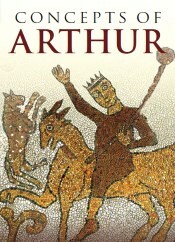 It is largely derived from my book, The Streets of Louth, which offers much additional detail on this area of town and the people who lived in it, along with information on the early history of all of the streets and significant buildings within Louth; it is available to buy as a paperback from the link above. A previous entry on this blog included a discussion of the villa-palace at Greetwell Fields, located just to the east of Lincoln, thought to have potentially been the residence of the Late Roman provincial governor of Britannia Secunda. As was mentioned in that entry, it has been suggested that the villa-palace's estate may actually have been preserved intact throughout the whole of the Anglo-Saxon period, and it is in this light that the following interesting note from the 1940s is reproduced below. It is a little hand-made jar in a rough hard grey ware, with a wide flaring lip, a sharply biconical profile with a marked carination, and a well-defined flat base (fig. I, 3). The biconical form and the lip are distinctly Anglo-Saxon, but both the fabric and the base are much better formed than is normal with Anglo-Saxon vessels of this type. It gives the impression of having been made by someone familiar with Romano-British wheel-turned wares. Now this pot, which is in the Lincoln Museum, was found in the Roman villa at Greetwell, two miles east of Lincoln along the Roman road from the Eastgate. There is no doubt of its association with the villa, for there is a drawing of it in the Lincoln Museum in a manuscript volume of sketches of the villa and its contents prepared by the architect in charge when the building was excavated. It thus belongs to a category excessively rare in this country, that of objects of Anglo-Saxon character found in Roman villas. This is not the place to speculate on the significance of such an association two miles from Roman Lincoln. It is, however, a reasonable guess from the hybrid character of the pot that its presence in the villa is not wholly fortuitous. It does not look like a casual dropping of a passing raider, or even the trace of a sixth-century Anglian picnic. It suggests rather that somebody was still living in the Greetwell villa who had a use for strongly fashioned, almost stylish, hand-made pottery at a time when it was usual to make pots of Anglo-Saxon design. In the second quarter of the seventh century, Paulinus converted to Christianity at Lincoln an Anglian noble whom Bede (Hist. Eccles. ii. 16) calls the Praefectus civitatis. Had he a predecessor, Angle or British, in the second half of the fifth century? The above discussion contains much of potential interest, of course, not least the suggested 'hybrid character' of the pot and the points made with regard to the pot as a possible indicator of post-Roman domestic activity at the villa site. 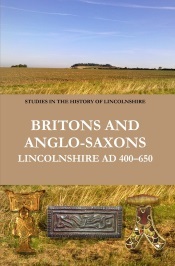 The latter topic was, in fact, returned to by Myres in the 1980s, when in the context of a discussion of the 'unusual degree of Romano-British survival' in and around Lincoln he reinforced his earlier position, stating that 'the presence of a very early Anglo-Saxon pot in the Roman villa at Greetwell, east of Lincoln... is suggestive, in this connection, of possible continuity of occupation there' (J. N. L. Myres, The English Settlements (Oxford, 1986), p. 182). Needless to say, given recent interpretations of both the Greetwell villa-palace and the situation in the post-Roman Lincoln region, Myres' observations on the Greetwell pot and its implications are intriguing and worth at least noting, hence the present post. Finally, before leaving the Greetwell villa-palace in the post-Roman period, one other supposed Anglo-Saxon find from this site needs mentioning. 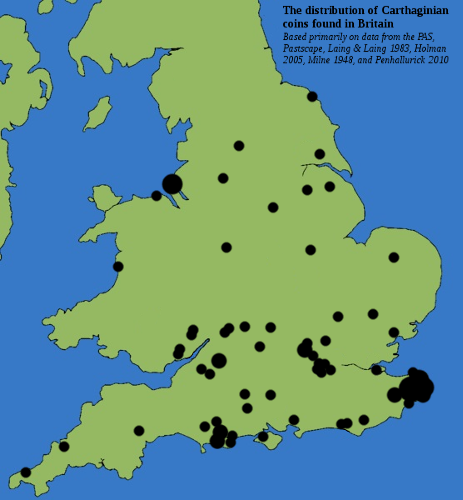 This is the 'Saxon spear' that is sometimes claimed to have also come from here, as on Historic England's Pastscape database and in T. Bell, The Religious Reuse of Roman Structures in Early Medieval England, BAR British Series 390 (Oxford, 2005), pp. 47, 171. With regard to this item, it is perhaps worth emphasising that it is illusory and such claims are based on an outline report of a find from 1952. Consultation of the full record in the Lincolnshire HER (PRN 52828) and B. Eagles, The Anglo-Saxon Settlement of Humberside, BAR British Series 68 (Oxford, 1979), vol. 2, p. 378, indicates that a spearhead was indeed found then, but that it is Late Saxon in date, not early Anglo-Saxon, and that it was furthermore discovered a mile to the east of the villa site.